The Harvard–Yale Regatta or Yale-Harvard Boat Race (often abbreviated The Race) is an annual rowing race between the men's heavyweight rowing crews of Harvard University and Yale University. First contested in 1852, it has been held annually since 1859 except during major wars fought by the United States. The Race is America's oldest collegiate athletic competition, pre-dating The Game by 23 years. It is sometimes referred to as the "Yale-Harvard" regatta, though most official regatta programs brand it "Harvard-Yale." Originally rowed on Lake Winnipesaukee, New Hampshire, it has since moved to the Thames River, near New London, Connecticut. Although other locations for the race have included the Connecticut River at Springfield, Massachusetts, and Lake Quinsigamond at Worcester, Massachusetts, the Thames has hosted The Race on all but five occasions since 1878 and both teams have erected permanent training camps on the Thames at Gales Ferry for Yale and at Red Top for Harvard. The race has been exclusively between Yale and Harvard except for 1897, when the race was held as part of a three-boat race with Cornell on the Hudson River at Poughkeepsie, New York, where, although it lost to Cornell, Yale was deemed the winner of the Harvard-Yale race. On May 24, 1843, with the arrival of the shell Whitehall in New Haven, Yale University founded the first collegiate crew in the United States. A year later, Harvard founded their boat club. These boat clubs served primarily a social purpose, until Yale's 1852 issuance of a challenge to Harvard "to test the superiority of the oarsmen of the two colleges". The first Harvard–Yale Boat Race—and the first American intercollegiate sporting event—took place on August 3, 1852. In this two-mile (3.2 km) contest, Harvard's Oneida prevailed over Yale's Shawmut by about two lengths, with Yale's Undine finishing third. The first place prize was a pair of black walnut, silver-inscribed trophy oars. The trophy oars were awarded to Harvard by General Franklin Pierce who in 1853 became the 14th President of the United States of America. Today the 1852 trophy oars are the oldest intercollegiate athletic prize in North America. The race distance was increased to three miles (4.8 km) for the second rendition in 1855 and to the current four miles (6.4 km) in 1876. The Oxford–Cambridge Boat Race is the only longer side-by-side rowing event in the world, though slower stream makes the Yale–Harvard Race one to three minutes longer. Originally the race was just between the varsity crews but there are now three events: the 2-mile (3.2-km) freshman race, the 3-mile (4.8-km) junior varsity race, and the 4-mile (6.4-km) varsity race. The varsity crews compete for the Sexton Cup, the junior varsity for the F. Valentine Chappell Trophy, and the freshman for the New London Cup. The Hoyt C. Pease and Robert Chappell Jr. Trophies are awarded to the team that wins the majority of the three races. Typically the day before the freshman, junior varsity and varsity races, there is a two-mile (3.2 km) race between the spares for both crews. These "combination" boats are made up of second freshman boat and third varsity boat rowers (i.e. the "combi" or "combo" race). The winner of this race gets the James P. Snider Cup, as well as the right to paint its school's colors on the "rock" at Bartlett's Cove for the next day's races. Currently Harvard leads the varsity series at 95–55, the second varsity (JV) at 75–38, and the freshman series at 72–39–1. Yale holds the upstream course record with its time of 18:35.8 in 2015. The Crimson set the downstream—and Thames River course—mark of 18:22.4 in 1980. The Sexton Cup is presented to the winner of the varsity heavyweight race. The trophy is actually a combination of two former rowing trophies: The bottom is the original base of the Sexton Cup, with year-by-year results of race winners, while the upper portion retains the Yale and Harvard seals from the trophy which was awarded to the winner of the (now discontinued) graduate eights race. The F. Valentine Chappell Trophy is presented to the winner of the second varsity heavyweight race. Previously used for a discontinued event in this regatta, it was redesignated in 1983 to be awarded to the victor in the junior varsity contest. The New London Cup is presented to the winner of the freshman race. The city of New London donated this silver award in celebration of its bicentennial and it is inscribed with the Seal of the City of New London and engraved with a ship bearing "Mare Liberium" (Freedom of the Seas). As of 2014, both schools began boating a 3V lineup for this race, rather than an all-freshmen lineup. The Hoyt C. Pease and Robert Chappell Jr. Trophy is presented to the crews who win two or more of the varsity, junior varsity, and freshmen races. This sterling silver bowl was donated by George Pew, Yale Class of 1958, in honor of Pease and Chappell with the inscription: "Named in honor of their great contribution over four decades to the spirit and success of The Boat Race." The James Snider Cup is awarded to the winning crew of the Combination race of the Harvard–Yale Regatta, which is held annually in New London, Connecticut. The Combination crews are typically composed of rowers from the third varsity and second freshman boats of their respective programs. Traditionally the two crews race a 2-mile (3.2-km) course the day before the Regatta, with the winning crew earning both possession of the Cup and the right to paint the large rock surface south of Bartlett's Cove—typically the most popular viewing spot for the Regatta's main events the next day—with their school's colors. The James P. Snider Cup was dedicated in honor of James P. "Jamie Sniderman" Snider by the Yale Heavyweight Crew Class of 2005 following the Harvard–Yale Regatta held on June 11, 2005. The cup was donated in honor of Jamie's years of dedicated service to both the Yale Heavyweight Crew and the Yale Crew program as a whole. In 1995 and 1996 Jamie served as an assistant coach of the Yale Women's Crew, leading the 1995 Third Varsity to a 10–4 record. After becoming an assistant with the Men's Heavyweight squad, Jamie led the 1997 Third Varsity Crew to an undefeated season, an Eastern Sprints Gold Medal, and a victory in the Combination Race of the Harvard–Yale Regatta. Jamie's 1999 Combination crew earned the right to paint the rock as well. Currently, Jamie serves as the assistant coach of the Women's Program. In 2006 he led his Third Varsity Four to a third-place finish at the Eastern Sprints, and in 2007, 2008, 2009 he coached the Varsity Four to gold medals at Eastern Sprints and a sixth, sixth and third-place finish at NCAAs. In addition to coaching Yale crews during the season, Jamie has served as caretaker of Gales Ferry, the home and training site for the Yale Men's Heavyweight Crew during preparation for the Harvard–Yale Regatta since 1878. He has also served as Director of the Yale University Community Rowing Program since its inception in the summer of 1999. Originally established as a small pilot program, the program has since grown to include over 100 youth participants annually, providing rowing opportunities for organizations such as the National Youth Sports Program, American School for the Deaf, and the Connecticut Special Olympics. a. ^ Yale ran into Harvard, which was leading at the turning stake. b. ^ Yale collided with Harvard. c. ^ Yale stroke broke oar and dove overboard. Yale still won the race. d. ^ Triangular races included Cornell. Cornell won. e. ^ Yale stroke ejected from shell near three-mile mark. f. ^ Shortest race in series history. g. ^ Yale's seven seat lost oar and dove overboard at two-mile mark. h. ^ The Harvard boat swamped in rough conditions, and the race was abandoned with Yale ahead. The race was declared to have no official result in January 2017, following an appeal. a. ^ Final time an entry was composed entirely of freshmen. b. ^ Yale's 3V8 competed in this event. Begun in 1920, the combination boat is manned by rowers from the third varsity and second freshman boats, the strongest substitutes available to the junior varsity and freshman boats. a. ^ This was the inaugural contest for the James P. Snider Cup. ^ The first regatta of the Rowing Association of American Colleges was held July 21, 1871, at Ingleside, Massachusetts, on the Connecticut River. Massachusetts Agricultural College won the university race with Harvard second and Brown University third. Yale did not participate (nor join the RAAC) but continued to dispute its disqualification in the 1870 race with Harvard. "Record of the College Regattas: From the Winnipeseogee Contest in 1852 to that of Yesterday". The New York Times. July 15, 1875. ^ In the RAAC university race of 1872, Harvard finished second and Yale sixth among six entries. Amherst College won in 16:32.8 or 24.2 seconds ahead of Harvard. The crew generally rowed 40 to 46 strokes per minute. "The College Regatta: A Victory for Amherst. Another Surprise—Amherst the winners in 16:32 4-5, the best time on record ...". New York Tribune. July 25, 1872. p. 1. According to The New York Times, "A very strong current and quite a fresh breeze helped them along". ^ In the RAAC university race of 1873, Yale was finally declared the winner and the other places were not declared. "Shortly before midnight the referee announced that he would only decide upon the first position for the time being, and Yale he declared the winner of the race. The decision on other positions are reserved for a future time. Capt. Babcock, the referee, has stated to the Harvard boys that he is compelled technically, to award the University race to Yale, but he stated that the flags were not correctly placed at the finish, and that, consequently, the course on the east shore was much greater than on the west shore. The Harvards claim that the champion flags were awarded to them by the judges, whose judgment, like that of many others, was that Harvard had arrived at the finish in advance of all the crews ..."
"Referee's Decision: Yale to take the Championship Colors". Boston Daily Globe. July 18, 1873. ^ After two days of postponements a much diminished crowd watched the university race of the RAAC Regatta at Saratoga in 1874. Columbia won the race (unofficial time 16:42) officially followed by Wesleyan, Harvard, and six others, finally Yale. "It was unanimously acknowledged that Yale had the lead and Harvard second.Harvard's boat then ran into the Yale boat, breaking the latters' rudder." ^ In the RAAC university race of 1875, Harvard finished third and Yale fifth among thirteen boats. Cornell won the race. Yale had been the betting favorite with Cornell second. "The News in this City: Intense Excitement Throughout New-York". The New York Times. July 15, 1875. p. 2. ^ The 1876 Harvard–Yale race introduced both the eight-oar crews with coxswain and the 4-mile distance, two features borrowed from the Oxford and Cambridge Boat Race. Peter Mallory. The Sport of Rowing: Two Centuries of Competition. Four volumes. Henley-on-Thames, England: River Rowing Museum. 2011. Selections published online in advance as row2k.com Exclusive Features. "Bob Cook: Pilgrimage to Britain – The Bob Cook Stroke". Mallory (2011), vol. 2, ch. 27 (pp. 312–18). "American Collegiate Rowing Takes Shape: Harvard versus Yale – The IRA". Mallory (2011), vol. 2, ch. 28 (pp. 319–29). Both featured online by row2k.com in (Mallory, chapters 27–35) (pages 312–60). Retrieved 2013-05-11. ^ Yale defeated Harvard soundly in a race of eight-oared boats in Springfield on June 30. Harvard continued west to Saratoga for the RAAC Regatta ("the Harvard six", for the Association championship matched "coxless sixes") but Yale did not participate. Harvard did not participate again and the Association disintegrated during the next several years. Regarding the Saratoga and Springfield events: "Yale does not row there, and Harvard will not after this year, but the eight-oared bout between Yale and Harvard, so successfully inaugurated to-day, will undoubtedly become an annual and permanent institution." "College Regatta: Yale and Harvard Eight-Oar Crews Try Conclusions. The Contest Takes Place on the Old Connecticut River Course." Chicago Daily Tribune. July 1, 1876. p. 8. ^ Two sources report time 20:19.6 for Harvard, different but greater times 20:19.8 and 20:29.8 for Yale, and Yale the winner. ^ Following the race in New London in June, the schools held an exhibition in August on Lake Winnipesaukee to celebrate the 100th anniversary of the first regatta. The race followed the original script, with Harvard winning by 2.7 seconds. "Harvard, Yale to Race Exhibition in August; Practice Starts Today" and "Harvard–Yale Regatta – 150 Years of Tradition". ^ "USRowing". Archived from the original (aspx) on January 3, 2007. Retrieved 2007-01-17. ^ a b "America's Oldest Intercollegiate Athletic Event". Prior to May 2, 2001. John Veneziano, Harvard Sports Information Director. Harvard University Boat Club (HUBC). Archived 2011-04-29. Retrieved 2013-05-09. Unchanged 2001 to 2011 except the closing sentence, "The last four races have been split between the two crews." ^ a b "Great Moments in Yale Sports". Yale Alumni Magazine. March 2001. Archived 2012-11-14. Retrieved 2013-05-09. ^ a b Lewis, p. 224. ^ "Harvard–Yale Boat Race Turns 150". Harvard Magazine. May–June 2002. 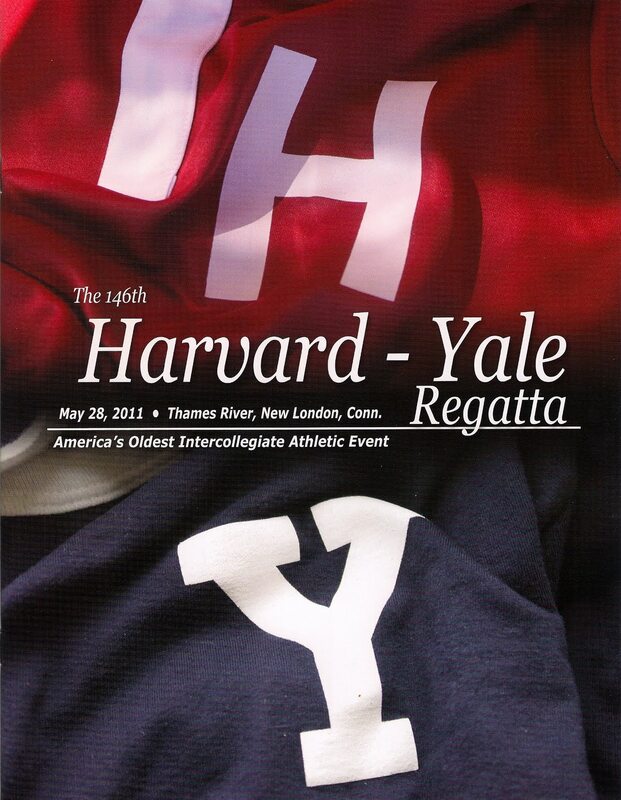 ^ a b c "The 144th Yale-Harvard Regatta" (PDF). Yale University Athletics. June 13, 2009. Retrieved 2014-06-09. ^ "Harvard–Yale Results" (1852 to 1906). Prior to June 25, 2001. HUBC. Archived 2011-04-30. Retrieved 2013-05-09. ^ A second source for results from 1876 through 1903 is The World Almanac and Book of Facts. New York: Newspaper Enterprise Association [etc. ], 1800.[when?] pp. 267. ^ "row2k Results" (1997 to date). (row2k.com). ^ a b c d e "Harvard–Yale Regatta – 150 Years of Tradition". Retrieved 2013-05-10. ^ Benbow, Julian (Jun 13, 2016). 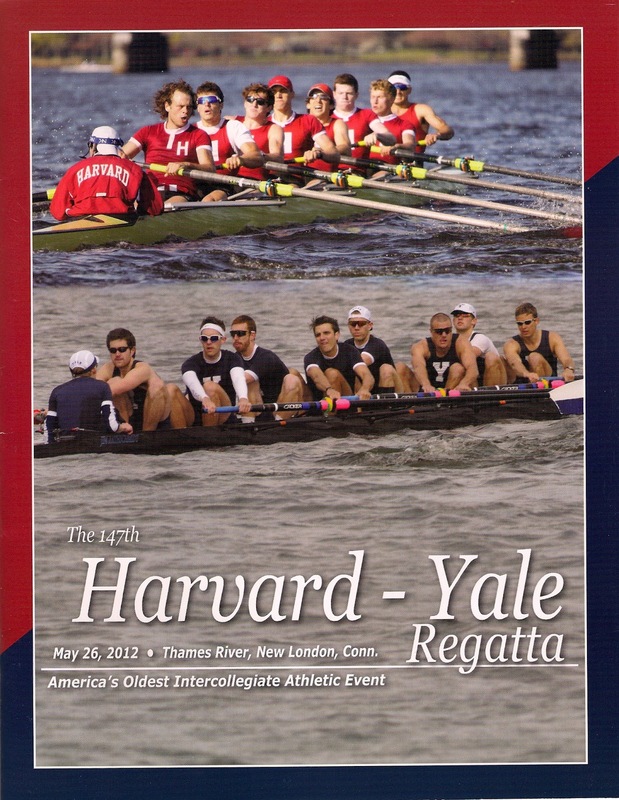 "Harvard boat sinks, regatta vs. Yale ruled no contest". BostonGlobe.com. Retrieved Jun 30, 2016. ^ Alderman, Joel (Jun 28, 2016). "Harvard crew not finishing race against Yale this month is somewhat like 1874 when Yale stopped rowing after collision with Harvard's shell". SportzEdge. Retrieved Jun 30, 2016. ^ Fuller, Jim (2016-06-12). "Chaotic Harvard-Yale Regatta produces cloudy result". New Haven Register. Retrieved 2016-06-30. ^ "Bulldogs Hang Tough, But Harvard Holds On to Win The 145th Regatta". Yale University Athletics. May 29, 2010. Retrieved 2010-11-26. Lewis, Guy. The Beginning of Organized Collegiate Sport, American Quarterly, Vol. 22, No. 2, Part 1. (Summer, 1970), pp. 222–229. Whiton, James M. "The First Harvard–Yale Regatta". Outlook LXVIII (June 1901): 286-89. Wikimedia Commons has media related to Harvard–Yale Regatta.